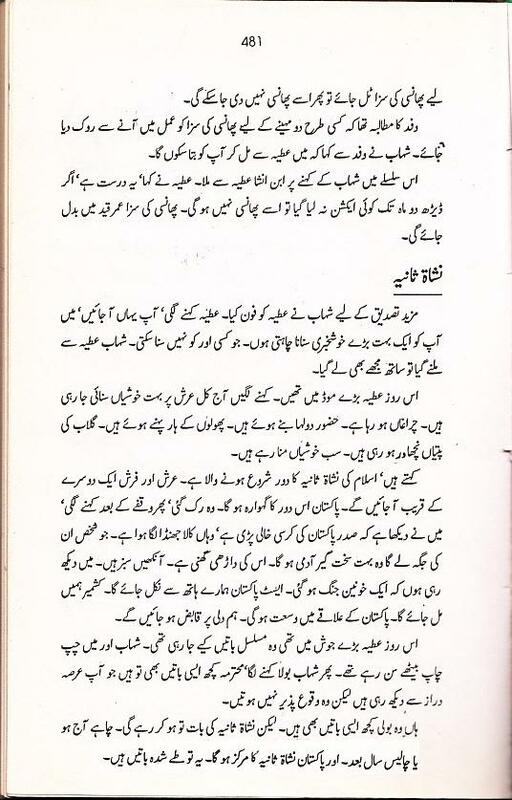 Lady Atiya also informed Qudrat ullah Shahab that conspiracy to overthrow Ayub Khan was taking place. She even pointed out some people who have planned to assassinate Ayub Khan by poisoning him. After furtive investigations, these warnings were recognized to hold veracity and people implicated eventually also confessed of this assassination attempt. 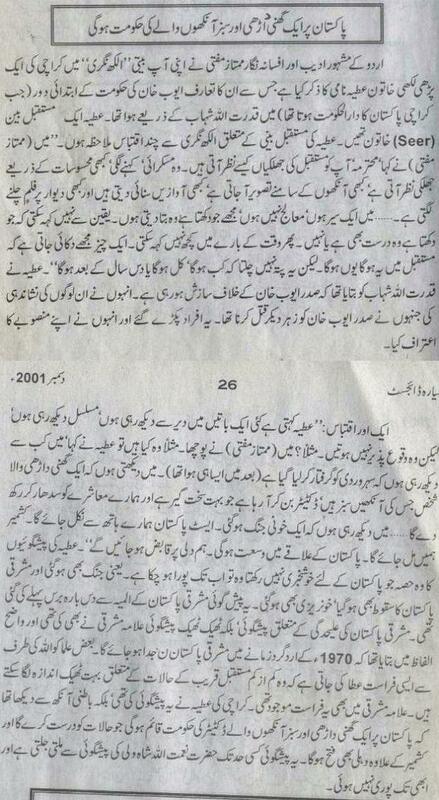 Lady Atiya’s predictions which were unfavorable to Pakistan, i.e. East Pakistan seceding has already been fulfilled. These predictions had been made by the lady ten years before the Dhaka debacle. The same prediction had also been made by Allama Mashriqi so much so that he had also highlighted that it would happen around 1970. Allah grants knowledge to some scholars such that they are at least shown of events that are to be implemented by Allah in the near future. Similarly, Lady Atiya was also a blessed seer and was dispatched information of the Stern bearded green eyed dictator who will straighten out the miss-doings in our society. This portent also somewhat matches those of Nemath Ullah Shah Wali but has yet to manifest itself. She expired in 2004 and is buried in PECHS next to her husband Maujood Saheb, her father Ibrahim Saheb and her daughter SHAHDAB who preceded her in her journey to the eternity. InshAllah complete article will be posted with English translations of some important parts. m happy to read this!! Iqbal Diwan Saheh said he knows 'Ninety' Saint as Atiya Sahiba told him. Yes you are right. Age of Sheikh Nazim was 38 (1960-1922). In your first link (Link 1) it is written a personality with name Ninty leaded QudertulAllah Sahab sahib for several years. In all these years name of this saint remained Ninty. So I assumed it is not age but nick name or title of this saint. I am wrong in my assumption :). Any contact number of this kind lady?Atiya? She was expired in 2004 and buried in DHA Karachi. sorry buried in PECHS according to Iqbal Diwan. Brother Iqbal Diwan sent me important chapters about Mohtarma Atiya today after reading this post. InshaAllah I will do new post day after tomorrow. OK I will send him email tomorrow, lets see whether he discloses his name or not. In afghanistan we are seeing what happened to these technologies? An infidel puts his trust in his sword, A momin only in Allah. Let the fight begin! bring a lot of bodybags with you! As for the invisible tanks and lasers, please use them in Afghanistan and be victorious there, then we will talk about your weapons prowess! Allah Ta'ala sent Jibraeel (A.S) from the seventh heaven to earth to save Prophet Yousuf(Joseph)(A.S) falling in the well ... you people haven't even gone above the first heaven yet ... and it takes about 13.7 billion light years to get to the edge of the KNOWN universe (about 3%) ... that's included in the first heaven ... so how many light years is it from seventh heaven to first? Jibraeel (A.S) was here in a matter of miliseconds or even less ... Have that technology? There are two angels with you at this very moment, invisible. And a total of 16 billion with evey human on this planet (considering a population of 8 billion) ... Have that big an army? Allah has angels whose heights are such that the distance between their one of their heels and ankles is 500 years ... Have the power to create such beings? The angel of death can get to anywhere in the world in miliseconds to pick up souls ... Have that speed? These are already defeated in Afghanistan. Here is another good question: what are the chances of america to crush pakistan in near or even far futur? Technology can only destroy another technology. Can computer virus harm a bicycle? Can deadly weapons of state of Israel help to destroy stones of Palestinian boys? Any radar system cannot detect these stones.... Atomic weapons of USSR couldn't save her.... They can only kill us using technologies but not defeat us.... When Jews become Muslims and good Christens make alliance with us then we also get all these technologies, Insha'Allah. Islamic Union will have all these technologies. ye technologies tu ALLAH k samnay kuch bhi nhi hein. Abhi recently Japan ki example sb k samnay hy. sb kehtay thy k Japanese ny earthquake proof buildings bnai hein, dosri nations ko in sy hi kuch seekhna chahiay. Lekin kya hua k earthquake aur flood sy un k nuclear rectors aur dosri important buildings sb destroy ho gai. Natural calamities k samnay koi kuch nhi kr skta hy. jahan tk baat hy America ki tu us k baray main boht si predictions hein k wo bhi natural calamaties sy hi khatam ho ga. I've read a lot about these technologies but what if it won't work?Whey we are depending too much on technology? We have no electricity, no water, Lets try to work without it. What if there is a electric fallout in big apple, do you think they can cope with better then we do? Don't you think these hardships are making us strong. What we need is UNITY, FAITH and discipline. After any nuclear explosion there is no electricity no nothing. At that time only duas work. I agree this is blessing in disguise. Now we have nothing to lose. In other words, its commando training of whole Nation. It seems you guys will be waiting for other people (Jews and christians) to bring knowledge, skills and experience to help you fight against technologies rather than doing it by yourself. Yeh tu lol ho gaya. What you guy say about zaid hamid? See my comment below in which I provided the list. HUM LOG HOSH MAY KAB AIAN GAY ????????????? "I have seen innumerous times that as a result of a very gory war, East Pakistan will be severed from us, and Kashmir will become a part of Pakistan." In this statement she said that as "A result of a very gory war" it means that in a single war(1971) east Pakistan will be separated from us and Kashmir will be part of Pakistan but as we see the ground situation is different from this statement. Dosry baat onhon ne Nishat e Sanya ke baray mi ke hi ke ye ya to aaj hoga ye 40 saal ke baad. meray khyal se iss statement ke bad to 40 saal kab ke poray ho chukay hain. Lagta hai ke uncle mushi nay sara mamla kharab kar dya hi. No Its correct, that time will come in future, I will post another dream by Atiya after few days that's also interesting. Zaid Hamid sab app yaqeenan wo green eye mujahid nahi hai please kisi khushfehmi mai na rahain. Ye jann kar bari hairat hoi ke aap bhe issi blog per apni advertisement kar rahain hai. That's why as blog admin, I never took name of anyone ever because I am waiting for Amr-e-Elahi which will appear at last. May be anyone of above or may be any one which is still hidden. Who I am to decide let the destiny decide. I know just one thing this time He will be chosen by direct intervention of fate. Lets wait for that time with patience. Yet another 'Wo koi lower rank (sobedar major) ka sipahi hai', see comment above by intizaar. You see another added in list. Now lets see whom Allah chooses. InshaAllah when He will come, I will do this post again with his PHOTO. Until then we should pray and work hard for the betterment of our country. Also that person won't be none of the above, as whatever I have learnt about him is that he would be "Mujaddid-e-Wakt" and "Pir-e-Zamana". In my opinion, recent history (last 4-5 hundred years) should not have seen such a personality at least. And I see the plight of the age. Nay! I relate what God Almighty has told me. I see sedition and wars. Even the highest and the best. I see grief and sorrow everywhere. I see left and right. Masquerading as teachers and scholars. InshaAllah I will come back to Hazrat Naimatullah Shah Wali (ra)'s foretelling once again after few more posts. but on individual level. Besides praying and sadaqas what i think is becoming independent by growing vegetables in our lawn/balcony, dig a well, solar panels(only once, its a investment) coops for hen/turkey. Believe me! when first I've heard this idea i was laughing but now a days in these circumstances it will be a blessing. these are only some of my ideas but someone have any other idea, it will be good. Bhai me ne aap ke mashwaray pe amal kartay hoi ghar mai aik chota sa baghecha bana liya hai jiss mai me nay sabzyan bhendi, tori, kado, bengan ,mirch tamator weghara oga liya hai. I would like to reveal that "90" is none other than Sufi Barkat Ali sahab (rehmatullah alayh). This I was told by a friend at Dar ul Ehsan (Lahore division) and by a close associate of Barkat ali sahab. Also, I am honored to have personally met Q.U. Shahab sahab's niece. She also confirmed that it was Sufi Barkat Ali sahab. A khadim at Dar ul Ehsan Samundri Road was once cleaning the old study room used by Babaji and stumbled across rusty papers which were later found to be copies of the letters which Q.U. Shahab (rehmatullah alayh) used to receive. Lets see what Mohtarma Atiya said about it. I will add that chapter today. I tell you one thing, this is one of the signs mentioned in books that even persons who are waiting His arrival will go in disbelieve also and become hopeless. Now I am observing this situation and my believe becomes more firm that His arrival is near. Today's times dilemma is that there are so many blogs, so many forums that almost none of them has any credibility anymore. I do understand that but i have understood one thing. 1) More back in history one goes more facts were written lesser opinions were written. As education was not so common. So more truth can be found in old literature. And old literature was not like today very few books came out every year and writers were also experts on a large number of subjects not only specialist of maybe one small part like nowadays. 2)If one takes out novels and curriculum books. What is left is laws, written manuscripts from different times. What happened when which is more reliable. But try to find the original and read yourself otherwise one will be lost in opinion of someone who wrote it today. 3)Certain myths have appeared nowadays and before spreading them further confirm them. My highly educated brothers had doubts about even if allama iqbal ever gave the idea of pakistan. I got hold of his certain letters and yest his letters confirm many things. 4)Certain people were linked in certain eras. Either they were teachers or students of each other or they were at the same place working together. If one does not find complete account in one person's writings one gets some detail in the other person's writings. Allama Iqbal not only gave the idea of Pakistan, in fact he was the founding father of Pakistan. Don't worry about public opinion, it does not effect Orders and Plans of Allah (SWT). One point should be noted that this leader of Pakistan will not be Imam Mehdi.Imam Mehdi will be appear in Mecca during Hajj. This leader of Pakistan will be also a pious and good person. YE WO HAQEEQAT HAI JISS KO DAJJAL KE ASAR KE WAJA SE KOI BHE TASLEEM KARNAY KO TYAR NAHI. LEKIN YAHI TO MUNAFIQEEN AUR MOMINEEN KE DARMYAN FARQ HAI. One day someone will have green eyes by a chance and we will be clinging to that person. If some one come up with GREEN LENZE? THEN? pehli baat to yeh ke koi bhi agar aayega chaaye green eyed ho ya na ho usey koi faraq nahi parta ke aap us par belive kare ya na kare usne jo kaam karna hoga woh karega kionke yeh likh diya gaya hai ..
Life is not that so easy as you are expecting by reading all above future predictions, it is something more than that and needs to be discussed and understoon in detail. we all must work now at this very present moment to change the future, we need to put our efferts. future is Ghaib and remember that Ghabi is always Ghaib you will never know it before it really happens or otherwise it will take place when you will forget it. Alos we dont understand properly the symbolic language used for short explancation of mega events to happen. just think for Gree Eyes. I am standing in a desert, and a slight heated wind in blowing, I start to walk up towards a person standing on a hill. As i approach him, I recognise that he is Sarkaar e Do Aalam Rasool Allah SAW. He SAW has a grim expression in his blessed face. Ans he is wearing very thick armour covering all his SAW blessed body. From his SAW blessed feet to his blessed face. He is wearing a helmet as well. He SAW is also carrying a thick and big curved sword in his blessed hands. My dream ends and I wake up. 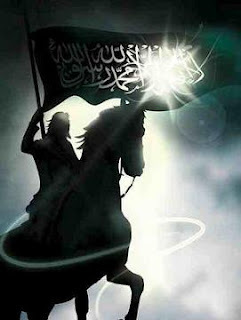 Since last 6 years, I have had 6 dreams where I have also had breif conversations with Rasool Allah SAW. Some messeges in the conversations are clear cut while others I cannot understand. LA ILLAHA ILLALAH MOHAMMED DUR RASOOL ALLAH SAW. MashAllah! Aap ko RASOOL ALLAH SAW ke ziyarat naseeb hoi mubarik ho. 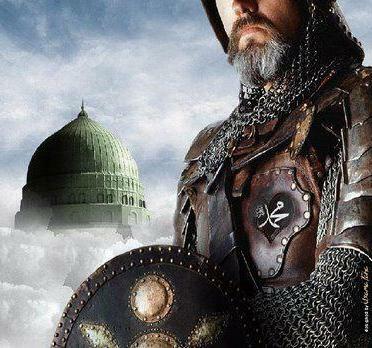 I humbly request you brother to please share with us about your dreams of RASOOL ALLAH SAW and what conversations you have with RASOOL ALLAH SAW in those dreams. As much as I would like to share all the dreams, some are only relevent for my circumstances and unanswred questions. I have only shared these dreams with less then 10 very close people. Please remember me in your prayers. I pray for Faqar brother and Baktar e Noor brother and all of you that we get to play a positive role in Allah's GRANDEST and FINAL plan.... The last Ghazwa! Btw, mey aik bohot hi aam sa dunya daar qism ka aadmee hoo. And Im always stupified and dumbfounded and reduced to tears when ever I think that Rasool Allah SAW blessed me with these exalted visits. Allah hum sab ke gunah SAW ke sadqey maaf karey, Ameen. The Green Eyed Person would never write columns in some newspaper or he would never try to publicise himself. He will emerge at the right time, most likey someone wih very low profile. Someone with very low profile, some ordinary guy living among us, would be the green-eyed man. Yar Faqr Bhai i need to share something with you please do contact me! Yes brother you are correct. All fingers and signs are pointing up to him. He will be our saviour and sipah salar of this nation. He is Sayyed and green eyed with jalal. He will be supported by a youth group and they will change the history our beloved watan Pakistan. You Might find some info here. There are a number of us who do (I happen to be Indian), & with that descend from Syed & Shaikh lineages from Central Asia (~Khurasan). The people of East Turkestan are probably heavily tinged with the original inhabitants with their unusual eye/hair colours. The Islamic university complexes of Samarkand & Bukhara were populated by mixed races with Arabians & locals. Mongol genocide sent scholars fleeing southwards. Later, Mughalistan sent new waves south. The point is not green eyes, but the collective region concentrating on Af-Pak/ Central Asia. Green eyes not necessarily mean that the awaited leader will have green colored eyes. Mayb it means that he will be a true Pakistani who feels for Pakistan and wants Pakistan to prosper and progress. His eyes reflect his love for Pakistan and as we all know that green colour is associated with Pakistan. Dreams do come true but not exactly as dreamt. Lady Atiya's dream gave away an idea of how the future of Pakistan will pan out. The awaited leader will surely come InshaAllah but not necessarily having green eyes. You people seem to have lost hope thts why this thread is so inactive. The reall hope has just begun with the fast developments unearthing through out the world especially the shift of power in Pakistan from the over hyped democratic loosers to our beloved army well supported by the whole nation. MashaAllah we are on the right path with bells ringing through out the world especially in India. The unrest in India, the tehreek of khalistan and the much desperate modi sarkar is taking us no where but a conflict leading to the great Ghazwa. This is the right time to start this awareness campaign of this dream the lady had and the great tidings mentioned for Pakistan to motivate the suddenly awakend people of the nation.